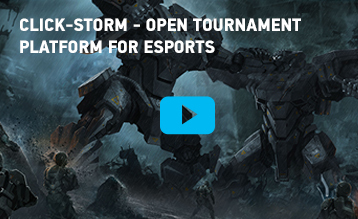 Click-Storm.com is an open tournament platform for competitive gaming. Click-Storm was founded by a group of enthusiasts from Singapore, USA and Russia in 2013. We have been competing since Warcraft 1 and still playing hard. Established in 2013, Click-Storm is an online eSports tournament platform that attracts and serves gamers and enthusiasts throughout Europe, Russia and Asia. We hold own events and support third-party organizers by providing access to platform community tools. Company also provides brands with forward-looking strategic consulting in esports to help drive user acquisition and retention. Our mission is to bring eSports closer to each avid gamer. We strongly believe that playing eSports and competitive games is exciting and requires a unique combination of passion and skill. eSports improves your reaction, perseverance, multi-tasking and accuracy; it also helps you make better decisions in real life. We would like to get in touch with developers and publishers. Please contact us to find out more how Click-Storm API can help you to engage audience. We can setup offline or online event according to your needs and resources. Please contact us to find out more how Click-Storm can help you to reach thousands of gamers.